I am attempting to make a bezel with HDglass. I know that it will never be optic clear, but some tests with the 10W leds I will be using shows the light transmission is perfect for what I need. The bezel is 100mm long (x axis), 50mm high (z axis) and 0.8mm thick (y axis). What I would like to do is bend the face of it. So, the x-axis would be curved a bit around the z axis. I understand how to use a difference to remove the back of a cube with a cylinder. 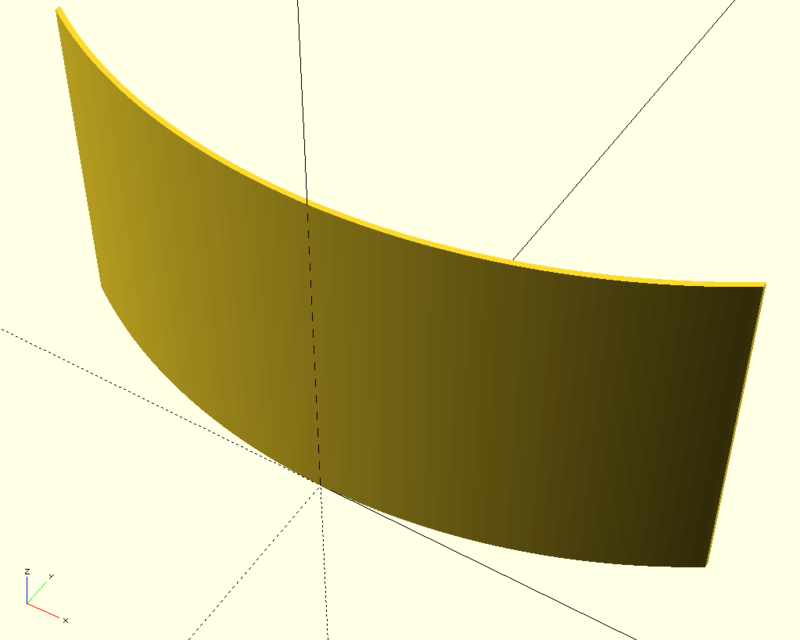 What I don't know how to do is curve the face of the block so that it is a consistent thickness the whole way. I assume it uses a function that I have not yet been able to discover yet. Can anyone give any assistance on this? we can change nothing about it still look both ways before they cross the street"
I tried to understand what exactly you are trying to build... Is it something like this? EXACTLY! Thank you so much, and sorry about the poor description. Edited 1 time(s). Last edit at 01/23/2018 08:03AM by andy.wpg.